Here we are in Feb 2013 and wow is it cold. So here’s The Hive Honey Shops Top 5 Tips to keep your bees alive! Check that your hives are secure, roofs have not been blown off, vandals have not disturbed your hives but that they are safe and secure. Snow! In many parts of Briton. So go check each hive and remove any snow blocking the entrances. Your bees can suffocate or succumb to a build up of moisture within the hive which is not good for them. Feed your bees if necessary. A simple gentle lift at one end of the hive will give you an idea if your bees have eaten all their stores. In this case give them honey fondant over the coverboard holes. Best to break bits and drop them down the holes to give your bees a hint that food is above and starvation has been avoided. Now’s the time to take inventory of what hive parts, frames foundation etc will be needed in the coming spring. Don’t wait- do it now BEFORE your bees need them. 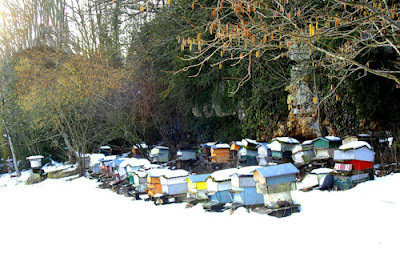 Take advantage of this quite period to get your bee requirements and apiary in order. Check that your mouse excluder is still in place. If you have woodpeckers in your area, protect your hive with netting. But most of all do not disturb your bees unnecessarily. Any knocks, bumps or vibrations can have a bad affect on your bees. They will use up their remaining energy to crawl up and see what all the fuss is about and eat more of their limited stores in the process. If you need to feed your bees do this quietly and do not linger about.